I haven’t pulled a “She Ordered What?! ?” since last week, but I’ve got a couple of things up my sleeves, friends. Don’t fret! Next week, I’m going out with a friend to an event he really wanted to attend, but wasn’t sure he would since his wife is traveling. I’m happy to play the stand-in for the evening. Based on the type of event (shhh…it’s under wraps for now! ), and the type of guy my partner in crime for the evening is, I’m confident that the night will make for a very fun post! Stay tuned for that one! I also had yet another restaurant graciously take pictures of a meal I had prior to starting this blog. I cannot believe how accommodating people are! That post will come up shortly as well. And, I had to highlight a couple of pieces of feedback I’ve received outside of the blog. I’m thrilled that people like this idea – and are giving it a try! First, I made the faux pas of turning a celebratory post on a delightful blog (that I encourage you to read!) into a small commentary about my blog. I’m sorry GenesisMeranda. Yet, I’m tickled by your encouraging comments, and I’m sending readers of this post over to read the comments! 🙂 (Yes, another shameless semi-plug). 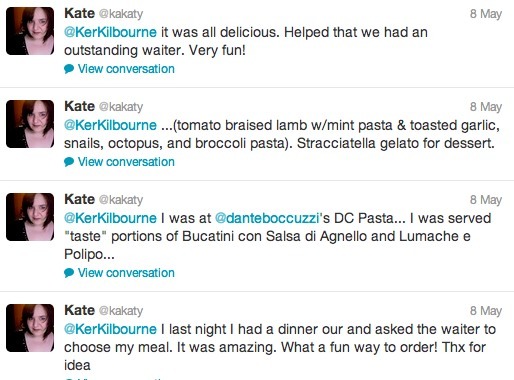 And, on Twitter, check out Kate’s reaction to her “She Ordered What?! ?” experience. And more…thanks friends and family! And, finally, thanks to Jerod, for including “She Ordered What?! ?” in his “Friday Links: Love For The Ladies Edition” Primility post. I am honored to have been mentioned alongside such wonderful company! I’m also honored to have had several guest-posts already. Thanks for all the support, Jerod, Lisa, Rachel, and dad! You are awesome and the site is awesome. Keep it up!